Happiness Project #31: Merry Christmas Red Velvet Whoopie Pies! This year, or to be more accurate, last year, my twin sister REALLY wanted something Red Velvet for Christmas Eve, so the baker in me was undeniably all too obsessively happy to oblige! 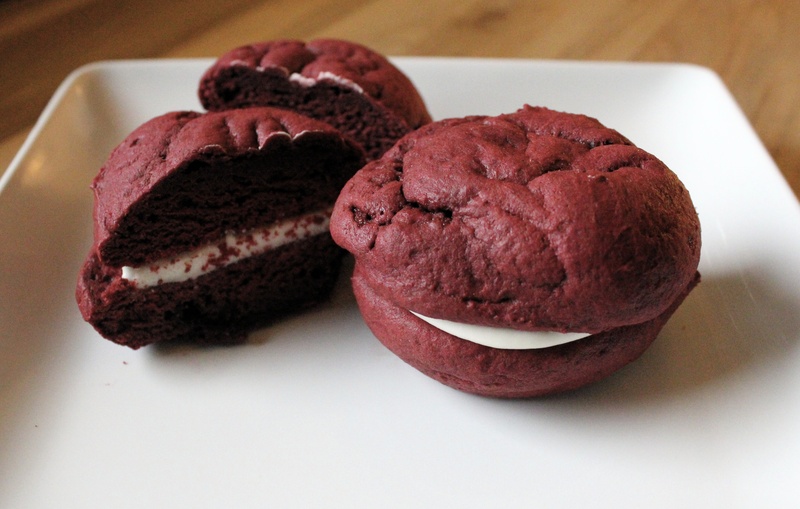 Enter the elusive Whoopie Pie. Firstly, what a rather festive, albeit somewhat silly, dessert name! Who comes up with this stuff, anyway?! Secondly, red velvet. Most of my family and close friends already know that I’ve never been a big fan of red velvet (desserts). If you’re going to give me chocolate then please just give me CHOCOLATE not COLORED chocolate. Chocolate is chocolate, right? Oh, SO wrong. Until I recently discovered a tub full of scrumptious red velvet cookies at Costco, nothing that I’ve tried has been impressive enough to replicate. But since making my family happy, makes me happy in turn, I went on a fairly exhaustive hunt for the best of red velvet dessert recipes. And was very pleased by what I found. At first, I thought about tinkering around with a red velvet cheesecake idea, yet as the hours until Christmas Eve started ticking down, I unexpectedly changed my mind. Since I still know a (surprising) number of friends & family who have never had the pleasure of tasting a Whoopie Pie before (some who have never even heard of the name), I knew it was the perfect opportunity to dapple around with one. With a twist. Why use something as simple as red food dye to color my cocoa when I could infuse it with actual red velvet flavoring instead? Which, to me, took these whoopie pies to the next level. Of yumminess. Don’t believe me? Try experimenting with both and you be the judge! Preheat your oven to 350F. Line 2 baking sheets with Silpat baking mats or parchment paper. You’ll need three separate bowls for this recipe, so add those to your placement of necessary kitchen tools. In bowl #1, whisk together the cocoa & baking soda. Set aside. In bowl #2, stir in the buttermilk, vanilla and red velvet flavoring until well mixed. Set aside. On a stand mixer, beat together the butter and brown sugar, at medium speed, until light & fluffy. Add in the egg until fully combined. After dropping your mixer speed to a lower setting, add in the flour, followed by the buttermilk mixture, in 3 separate batches. Always starting with and ending with the flour. Scrape down the sides of the bowl between each addition to create a smoother texture. Mix until just smooth (but do not over mix). Bake for 11-13 minutes. Whoopie Pies are meant to be a large, puffy type of “cookie” so don’t worry if you think that they are a bit soft once out of the oven. Cool throughly on a wire rack. In a bowl on your stand mixture, add in the cream cheese, butter, vanilla extract and powdered sugar, mixing at low to medium speed until well combined and smooth. Mix in the heavy whipping cream and whip at high speed for 2-3 minutes. Using a large spoon or large round decorating tip with a piping bag, spread a large dollop of filling onto one side of 6 of your whoopie pies. Press each 12 halves together and there you have it! 12 lovely, decadent Christmas Whoopie Pies! Your family or friends will adore these (and you for making them)! Happy New Year and Happy Baking, my friends! « Happiness Project #30: S’mores Cookie Sliders!